This is an approach that has been around in G1MRA for many years now and is widespread throughout the model railway hobby. By tradition it took the form of a fearful rat’s nest of wiring that only a few were able to decipher and manage, but fortunately things are now much improved thanks to technology. The famous G1MRA IMREX railway had a cabinet full of relays to effect this and was an icon of orderly complexity. Even so, it usually took a day or two to ‘settle down’ once it had been re-assembled. AH’s railway is fully signalled in the modern fashion courtesy of Ralph B-W and increasingly we are seeing radio control servos being used for controlling points and signals due to their wide availability, small size and low cost. Belatedly, I have started down this route and, now that our own trade are looking in this direction, I hope the following will be of some use and encouragement to those thinking of something similar. My reasons for getting involved in this are various: I like the idea of the increased protection at junctions by adding a visual warning to the existing audible bell warning described in the last NL&L. Signals always make a railway look more complete and not just a test track… And lastly, I felt like a challenge. The basis of the idea is that R/C servos are cheap, reliable, controllable and available. As a means of operating points and signals via modern electronic circuitry, they offer huge potential. 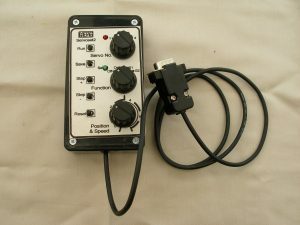 But to make this a practical proposition, the traditional interface that allows communication between the servo and the receiver has to be adapted at the receiver end so that a simple on/off connection will move the servo through a controlled action from one end of the desired travel to the other. This has to be repeatable time after time with utmost precision. 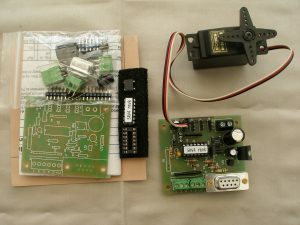 Having looked at various commercial and amateur offerings including Cliff Barker’s new module, I decided on the ‘Servo4’ produced by MERG (Model Electronic Railway Group) as this is very cost effective at less than £7 to control four servos.The downside is that it comes as a bag of bits, which is not for everyone and despite a 30 year career in IBM, it challenged my knowledge of power supplies as well as my eyesight. While it is probably doable by many who are handy with a soldering iron, some knowledge of electronics will go a long way particularly when something goes wrong and you only have a multi-meter to hand! Photo 1 On the left is how it comes. An hour or so later you have a working servo driver. Now MERG are a similar organisation to our own, but tend to concentrate on the smaller scales where the demand is highest, but size is not our problem and just about any servo can be used. In my case I have made a start with the servos being contained in the base of a gantry and extender leads reaching to a box with a MERG Servo4 driver unit under the baseboard. Having got this far, it was only a small step to include the main points in the equation and hence a bit of relay logic was required…. Then only another small step to include train sensing track circuitry…. And then linking the home and distant signals together via the relays … So you can see how by simply dipping a toe in muddy waters with a basic bell, I am now immersed up to my neck in a fully automated system. 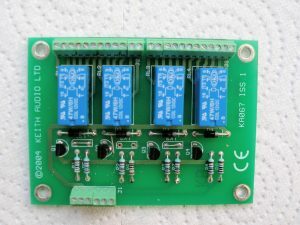 The logic that connects the switching of the points with the signals and the track circuitry is coming courtesy of some MERG relay board kits. These are very basic, but they do allow for very neat wiring and the ganging of relays to get enough contacts. A switch panel will be set up on a track diagram in the usual way, one half of a conventional DPST switch will actuate the signals and the other half, the points. Photo 2 This relay board is very basic, but by changing the header pins for screwed terminal blocks, I have some means of accommodating the logic wiring. We now have the basic components of the system, the relay logic is simply a bit of old fashioned fun with wires, but how do you set up the servos, which are our end product? Actually this is another good bit. You can either connect a serial cable into a laptop via the USB and download the setting software, or buy another kit for a hand held device which does the job manually. I felt the second approach was the more versatile and again had no real issues other than mucking up the silver decal. You only get one shot at it and mine missed! Photo 3 The hand held SERVOSET box is easy to make and very versatile to use. 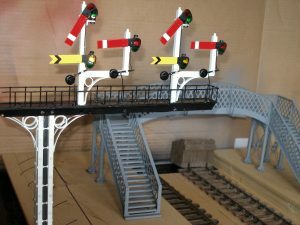 I had already built the gantry with its somewhat off-set configuration and was delighted with the signal arms and other components from MSE (Model Signal Engineering), but had an uncomfortable feeling that something was not quite right. I couldn’t quite figure it out until I tried to think through how the gantry would look if it spanned all four of the main lines… and then the penny dropped! Semaphore signals in the UK always have the arm arranged with the colour spectacles to the right as viewed by the driver with the arm pointing to the left…. Did you know that? Be honest! I called in my knowledgeable friends to inspect the signal and tell me what was wrong, but none of them spotted the error…. Well perhaps they were being polite! At this stage it was now clear that I knew nothing about the subject and was pleased when PA loaned me a book by Peter Squibb. It is a fund of useful knowledge which would have saved quite a bit of pain had I read it first. 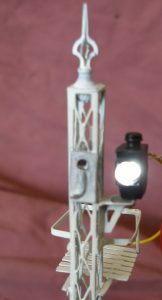 Among my errors I include drilling through the centre of the ‘Doll’ for the signal arm pivot when most are either offset, or on a bracket to the left of the post and also using GWR Lamp holders on a supposedly Southern gantry. To the first, I am guilty as charged, but (your honour) at least I had a purpose in the placing! Correcting the arms meant unsoldering, removing paint and glazing, and reversing them. This was a pain, but nothing like the pain felt when it was realised that all the lamp brackets had to be changed to the other side and that the carefully concealed wiring up the centre of the posts to light the lamps was also on the wrong side. (Oh yes… I forgot to mention this didn’t I!). Last and not least was that the actuating rods were all sited on the wrong side of the post! Anyway, it was now too late to scrap it all and start again and so I am stuck with quite a few anomalies, but given the apparent general lack of awareness with regard to signals, I am prepared to tough it out! The gantry needed to be offset as I did not want to span all four tracks at this point and there was no space for a supporting leg between the tracks. Although this is not based on any particular prototype, it follows the general principles of the pre-grouping period even to the extent of being over-engineered. Photo 4 You will note the robust construction, which is in part to counter the offset, but also to avoid death by pump handle… In fact, the Barrett footbridge behind the gantry in this mock up is at far greater risk and I have resolved to build a second gantry of enhanced proportions that spans all four tracks and acts as a loading limiter. Over 15ft in scale should be enough for most of us as even the Accucraft Hudson fits under this. Both the dolls and the main support are made from ¼” square material with one of the main supports and both dolls using hollow tubing for the lamp wiring. The servos are contained in the gantry itself and the arms and balance weights are set up so that they are in equilibrium and do not revert to stop as in the prototype. This allows me to use servos of lesser proportions and power. Photo 5 The lights are courtesy of 5mm white LEDs which are just about perfect and I would suggest that even if you aren’t bothered about lighting, these cheap-as-chips LEDs are ideal as lenses. The photo here shows an M.S.E signal currently undergoing restoration with a white-metal Southern lamp holder drilled out to take the LED. It looks even better in a GWR lamp casing as the rounded lens perfectly simulates the original. You will note that this signal has an elegant ‘Stevens’ finial whereas the gantry has none… You can guess why… I fitted them too early to the gantry and they did not survive being turned upside down and clenched between my knees every time something needed fitting. I will supplement the vestigial remains with 7/32” balls and spikes when all is complete. The best I have been able to do on ladders is to use Plastruct O Gauge. These are a temporary arrangement until something better materialises. The Peter Squibb book has a table showing every possible detail of just about every pre-grouping signal that ever was… This table shows every relevant dimension of signal ladders for just about every pre-grouping company… It is a nit picker’s dream! So there are no excuses available here. So what next? Coming out of the base are four servo extension leads and the two power leads to the lamps (Note that the two ‘distants’ are fixed). These will mate up with a box under the baseboard containing the MERG servo driver. From here, Cat5 wiring will connect via the relay boards into the bell box shown in the last NL&J which will be enhanced with a track circuit diagram, and point switches. Retro perhaps, but appropriate to the era. Next time I hope to describe how it was all brought together.